Happy New Year! We decided not to procrastinate and started our new a little early. Something sweet found itself under our tree on Christmas Eve (as I hinted to earlier)… Pepper, a 5 1/2 lb, 5 month old dilute calico adopted our family on Christmas Eve. I was a little nervous, as I have never lived with a cat. So far, she is so stinking sweet, we should have called her Sugar. The little quilt lover made herself right at home with us. I have managed to get back to my quilt lab to put finishing touches on some projects, and move others that direction. Well, Jessica IS correct! If anyone is a geek like me, or even if you aren’t, look it up and brush up on these crystalline beauties! Any snowflake with other than sixfold symmetry, is an impostor! Check out this fun science article from Jon Hamilton on NPR, All Things Considered, “What’s Wrong With This Snowflake?”. I completed the scientifically correct ensemble with some embroidered hemstitch napkins decorated with an ombré style embroidery design from Urban Threads, called “Let it Snow”. 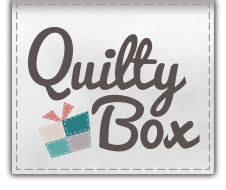 If you are into embroidery, check them out each month for a new freebie! This month’s is for pet lovers. Note: All Christmas Lego & crafting chaos has been ingeniously hidden outside of the camera field of view! I don’t have any more finishes to share, but did load and begin quilting my April Showers, Falling Charms quilt, and cut the pieces for a new Quick Curve table runner. My New Year’s Resolution is to put together at least one quilt class this year. I plan to combine all of the tips and tricks I have learned on the curve-it-up quilt, and share those with others! Who knows, if you aren’t already an expert, maybe I will see you in class! Curve It Up – Block 11 – Temperance? Who knew that some history of traditional quilt blocks could be found at the National Park Services website? Check out this Quilt Discovery Booklet posted there. The Drunkard’s Path from the Curve it Up pattern is the most traditional design in the book (my opinion). “A Drunkards Path” consists of 16 blocks. According to the Quilt Discovery Booklet, the Drunkard’s Path was popular during the temperance movement. The Temperance Union colors were white for purity and blue for water, the “purist” beverage available. I also made my block in Blue and White. However, if you know the source and how water is processed in many municipalities, I would not call it pure… If you live in the wrong place, you might even be drinking Lead. Maybe we would all be safer drinking Gin and Tonic! My favorite thing about this block is the fact that there are NO POINTS TO MATCH. If you can match rows with nesting seams, then this block is for you. It is a very forgiving curvy block. Temperance is not required. Cheers! If you are interested in the math of a drunkards path, read on. A traditional drunkards path uses a smaller radius of curvature, AND the center of the circle or arc is placed at the corner of the block. The block created with the Quick Curve Ruler uses a flatter arc, or a larger radius of curvature and the radius is placed further away from the corner of the block. You could create this same effect by creating your own template, but make sure that you have the arc hitting on equal sides of the square. When you cut traditional Drunkard’s Path blocks, the curve shown above is NOT your cutting line. The reason for this is that it doesn’t account for your seam allowance. Since you are stitching a concave piece to a convex piece, if you do not add additional seam allowance, your outside edges would not match. The beauty of the Curve It Up pattern is that it suggests you start with a larger square than you need, stitch your curve, then trim the block to size. The method is used for all of the blocks in the pattern. I think this could be used for the traditional curved piecing as well, but you would need to increase your original squares of fabric to accommodate trimming to size and would have to be careful to keep curves centered. I drew a curve using my Quick Curve Ruler and measured the length of a chord, and the height measured at the midpoint of the arc’s base. Using those numbers I came up with a rough calculation of my Quick Curve Arc Radius. Marking and matching seams was the most important part of this block. The seams are not pressed in opposite directions, so you WILL need to pin in order to match the seams perfectly. I think I used better fabric values in this block and am happy with the outcome. Block 10 is the Piece Star Block. I call it the “wish I squared my pieces up” block! If I made this block again, I would be sure to square up my center diamond blocks. I changed this design slightly by turning the corner background blocks into half square triangle blocks to introduce another color into the block. I should have nudged my diagonal seam over by the width of my thread to make the blocks the perfect size for piecing. All of these things would have made the block lie flatter when assembled. All of the seams create thick intersections, so I pressed most of the seam open to make them lie flatter. Whew… Too bad these fans don’t cool you off! The great thing about fancy fans is that if you make them meet in the center they will make Block 9 too, a curvy Dresden Plate! Keep tuned for more in November. It might take me four more to master this set. The next time around I need to add some additional light fabrics. Hint: BE SURE TO MARK FROM YOUR SEAMS ACCURATELY. (Otherwise you get to make an extra like I had to do. There is something to be said for not piecing late at night.) Keep cool! Better late than never… I finished this block a couple of weeks ago, but didn’t post it right away (sorry). This block was either more difficult than the others, or I am off my game. Be patient! Cutting was easy, utilizing the same techniques used in many of the first four blocks. I tried to pick colors carried over from the last block, but can see that it is time to throw some brights back into the mix. Since this block is chock full of curves, it was a perfect time to try out my new presser foot called the “Curve Master”. The Curve Master foot came with lots of shank adapters that I did not need for my Brother snap on shank sewing machine. I purchased the presser foot kit with some patterns on Massdrop recently as it was touted online as a great tool. The construction of the foot I received is plastic. Out of the box, I had to press the pin for attaching it to my machine as it was not entirely seated. The pin or post diameter seemed a little small, so the foot had a little play and did not sit as straight as I would like. If you look closely at my photo below, you will see that the right edge of the foot doesn’t make a clean straight line across my needle / throat plate. I’m not one to give up easily, or judge too soon. I proceeded to stitch all four of the curves utilizing the techniques shown online for the quick curve foot. The trick to using this foot is to slightly lift the top layer of fabric while feeding the layers between the feed dog and the foot. The fabric should align to the plastic guide wall on the right side of the foot to give you very even edge match. My edges aligned very well, but something went terribly wrong and my block was uneven. Enter… The seam ripper. My favorite seam ripper for quilting is the Clover 482/W. I have tried several brands (Dritz, Fo ns & Porter, generic rippers that came with my machines, Ginger, Seam Fix) but find this one to be sharp and has a fine point to catch the stitches. I also like the rounded handle. The only thing that would make it better is a silicone end like the Seam Fix and a hole to allow me to hang it around my neck! I always keep one close… What is your favorite? Leave me some comments. I think that my new presser foot might be defective. With a slightly larger press fit pin, better hole alignment and some polishing of plastic burrs left from molding or other manufacture, it might be handy. Someday, if I am bored, I will play with it again. Instead, I went back to my favorite 1/4″ foot for curves. Remember this? The diamond border was the most difficult. It you don’t get the narrow curves centered, then you will not have enough fabric to trim the nine block to the correct size for the next step. The overlap is not generous. If I was cutting fabric for the outer borders again, I would have paid more attention to pattern direction. I like that butting the strips together doesn’t matter here since that portion is trimmed off for the next curve. This would be a n interesting alternative to mitred corners for quilt borders. While way more complicate than a nine block, what should we have expected from a parametric diamond. Anyone up for a math quilt? After a month of stormy weather, broken arm blues, and family “vacation”, I sat down to complete the fourth block in the Curve it Up series. 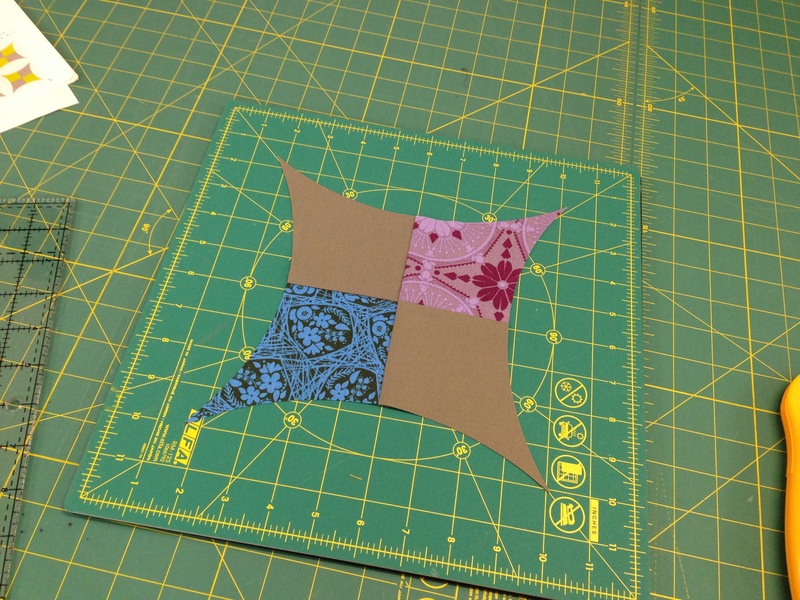 The four patch block was one of the earliest “block” styles used by quilters. It enabled them to use small “scraps” of fabric in their designs. I could see this lending itself to the use of old clothing, especially dresses or shirts that were not being up cycled to other clothing use. Can you imagine what early generations would think of our tag of “up cycling”. They would think it is funny how much we simply dispose of! The curved four patch is certainly not a simple stitching design due to potential stretching of the curves. Attention to detail for matching your corners is important, as is pressing and squaring the final blocks. I selected colors from my previous block, turquoise/blue and purple, to help tie the designs together. Funny, I must have picked colors for my mood, but even those are beautiful, life can’t always be rainbow! The squares in the pattern are 4 1/2″ and the strips are 2 1/2″ wide. This could be easily adjusted to be “charm pack” and “Jelly Roll” friendly. A whole quilt of this block would have sashing that looks like flower petals or leaves! Step One: Cut your fabrics. You will need 8 focus squares, and 8 background fabric squares. You will also need 16 of the 2 1/2″ wide sashing background fabric. There are lot of ways to lay these out. Pick oneyou like and stitch them together like four regular four patch blocks. Step 2: Sew the four patches and trim each edge of the blocks using the curve it up ruler. This is a great time to use a spinning rotary mat, the lazy “susan” of quilting. Several manufacturers sell these, Olfa, Fiskars, Martelli to name a few. I love them while working with small pieces and when cutting multiple directions. I used it for the initial curve trimming shown here and for squaring my blocks after stitching the sashing. Your block will not look like this (After trimming it will). It will probably look like this! Breath! You are fine. It is important to sew the opposing edges (left/right , top/bottom) to help keep the curve edges stabilized. After each curve is sewn, press the seams open to help reduce the bulk at the points. Step 4: Trim each curved four patch with a squaring template. Use your seams to help center and align the block with the ruler. Step 5: Make a larger four patch with your new blocks! Note: I again used the Terial Arts – Terial Magic to give my blocks better shape hold and to help prevent fraying as I store them for the rest of the year! This quilt pattern, “Curve it Up” by Sew Kind of Wonderful was gifted to me along with the “Quick Curve Ruler” . 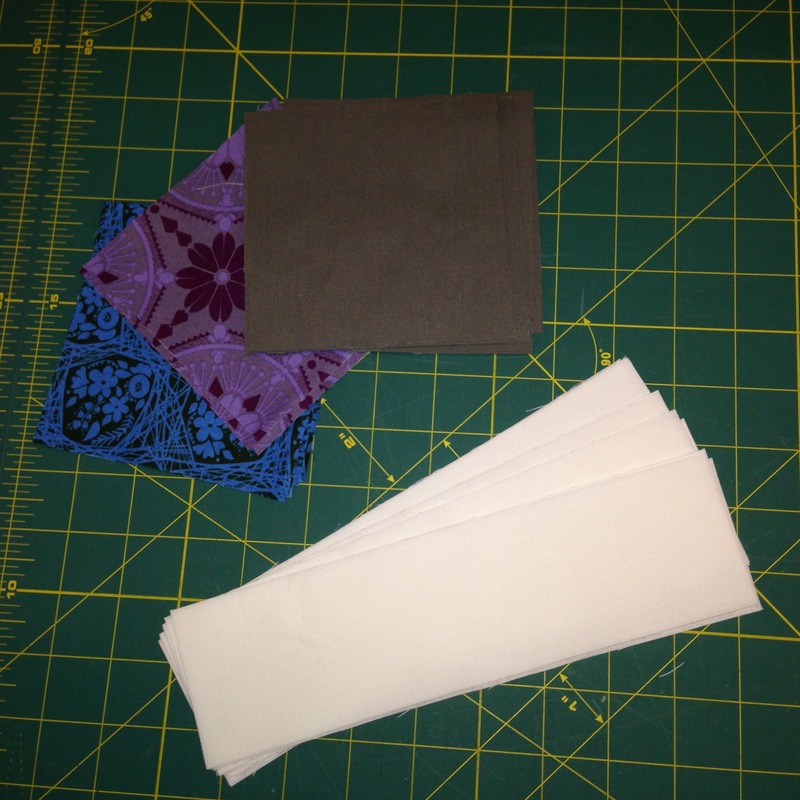 Over the next year, I plan to post information about the quilt construction and use of the curve it up ruler. Come learn with me! Let me know if there is anything else you want to see! I’m new to blogging and don’t know what others would like to see yet.